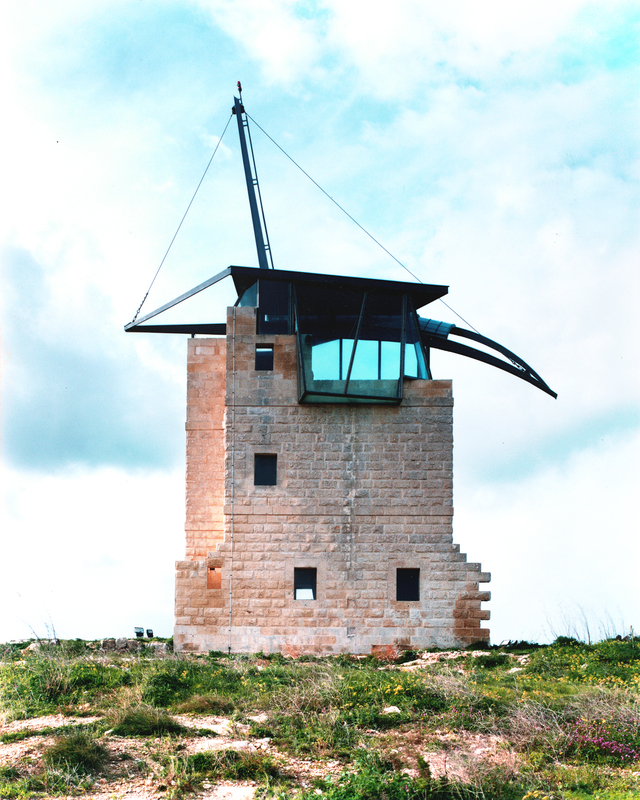 In view of its strategic position dominating the surrounding countryside of Gozo, Kenuna Tower is currently being used by GO plc, the local telecommunications corporation, for telecommunication purposes. It is significant that the construction of the tower on this site in 1848 was originally dictated by the need to provide clear visibility for the transfer of messages signalled from the structure to the other two of Malta’s three semaphore stations. Today it has resumed its identity as a communications building, this time housing contemporary telecommunication technology to provide security for the Malta-Gozo links, covering the Gozo area for radio-based services (cellular, paging, data etc. ), as well as other specific applications such as Maritime communications. The intervention on the tower is an insertion that is independent of the existing old structure thus avoiding any scars on the historic fabric: a single inclined steel column was inserted from which all the floors stem culminating with the roof which branches out from the main inclined rib and hovers above the old tower in such a way as to allow the sky to be seen right through the building. This is achieved thanks to the different character of the new intervention which is accentuated by the large areas of glass that cause the roof with its copper cladding to detach from the historic structure. In this way, when viewed from outside, the roof not only contributes to the preservation of the image of the tower as a fragment, but is also reminiscent of the wood and steel signalling structure the tower was originally created to support. All services, ducting, cabling etc. as well as the antennae for which the intervention was created in the first place, are surface mounted on the new structure.